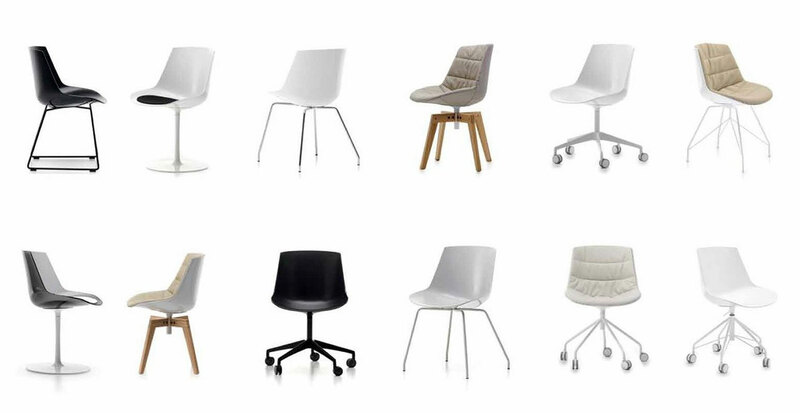 A family of seatings of great impact and comfort. Designed for the home, the of ce and the community areas. Available in two versions with a wide range of bases and nishes. The shell, made from polycarbonate through injection moulding, is mass-pigmented in the colour options white or black and has a standard double nish: gloss outside, and microgoffered inside. 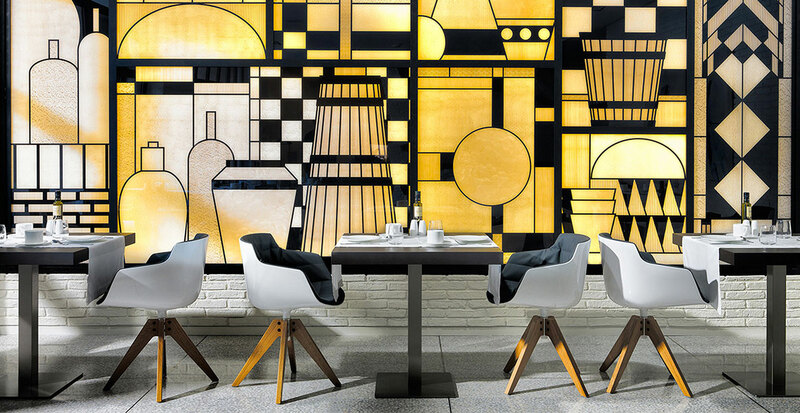 Flow Chair and Flow Slim seatings can be completed with upholstery: a thermoformed padded countershell with a small pad made from quilted polyurethane and polyester wadding. The new version PADDED XL is available for the Flow Slim only. XL padding is the natural development of the classical padding, consisting of a new quilting partially covering backrest and armrest. This gives a new look offering a great comfort. 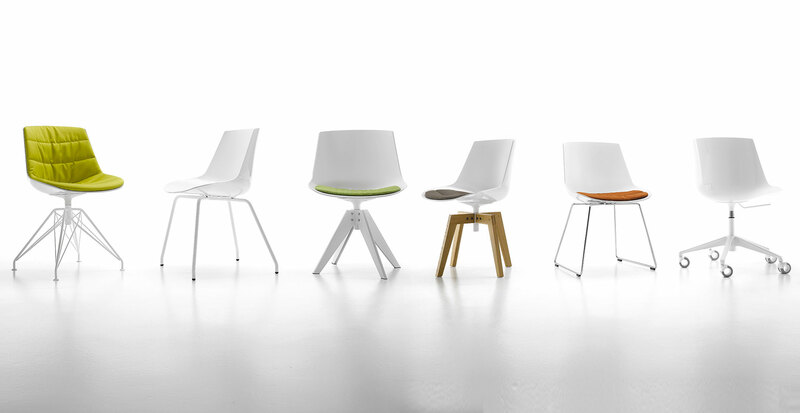 The padded versions can be upholstered in fabric or leather. Removable upholstery; extra cover available if requested. • 4-legged base in steel tube, painted matt white, matt graphite grey or chrome- plated. • sled base in steel wire, painted matt white, matt graphite grey or chrome- plated. • 4-legged steel base in folded sheet metal, painted matt white or matt graphite grey , with an aluminium coupling device painted in the same colour. 360° swivel. • 4-legged LEM base in double-layer tubular steel with connecting elements in steel wire, painted matt white or matt graphite grey. 360° swivel. • 5-point-star base in die-cast aluminium, painted matt white or matt graphite grey. 360° swivel. • height-adjustable 5-point-star base on castors, made of die-cast aluminium, painted matt white or matt graphite grey. Castors in the same colour of the base. Height adjuster (41.2/51.2 cm) crafted in steel. 360° swivel. 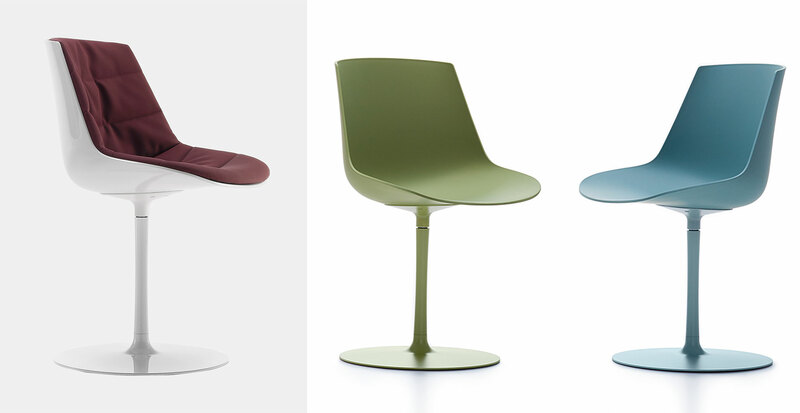 • 360° swivel base with central leg in aluminium, painted gloss white or matt graphite grey. 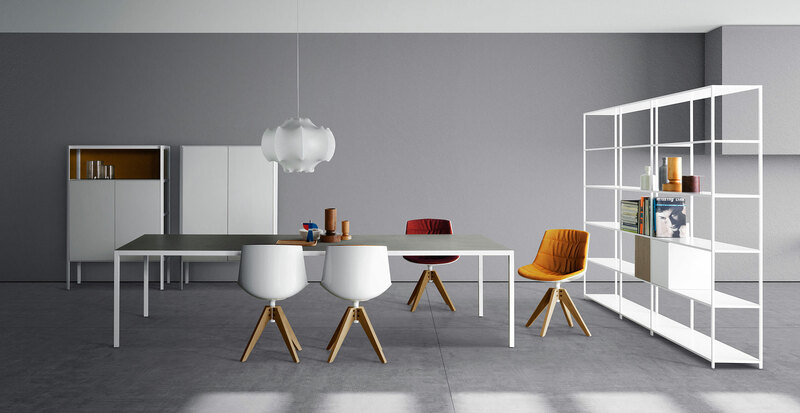 • VN 4-legged oak base, frame from transparent-lacquered natural oak solid wood with a natural, brown or bleached nish, with a lacquered steel coupling device painted matt white or matt graphite grey. 360° swivel. • 4-legged oak base, frame from transparent-lacquered natural oak solid wood with a natural, brown or bleached nish, with a lacquered steel coupling device painted matt white or matt graphite grey. 360° swivel. GEROSA DESIGN is a main reference of MDF Italia on the national territory (Como, Milan, Varese, Lecco and Monza and Brianza…) and internationally in all European Union, Switzerland, United States of America, Asia (Taiwan, Hong Kong, Singapore, Japan, China, Seoul South Korea), and not only… for the whole MDF Italia collection.